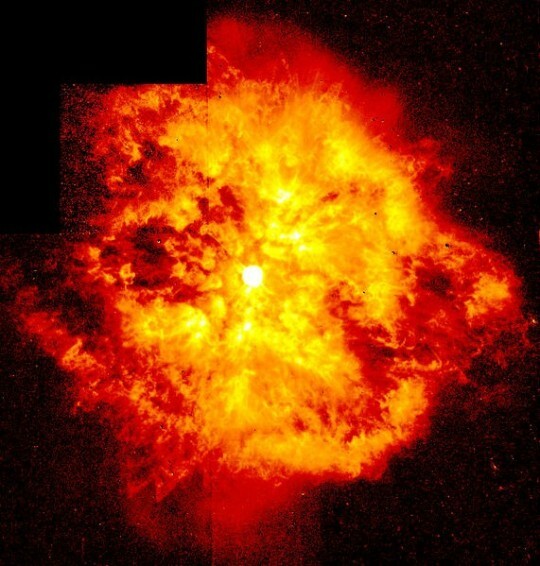 What happens when Betelgeuse explodes? Betelgeuse is already one of the brightest stars in the night sky, sitting somewhere around the 8th or 9th brightest star in the night sky. (These lists don’t include the Sun, which is somewhat obviously always the brightest object in the sky.) It sits in the constellation Orion, along with a number of other bright stars, and makes up the left hand shoulder of the warrior. 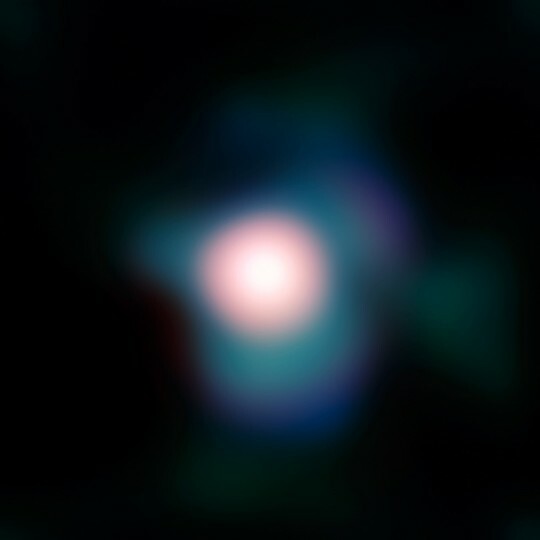 It looks visibly orange in the night sky, and is classified as a red supergiant star, in the later stages of its life. It’s also one of the few stars that’s close enough for us to resolve in more detail than a point source, and the pictures are pretty fun. 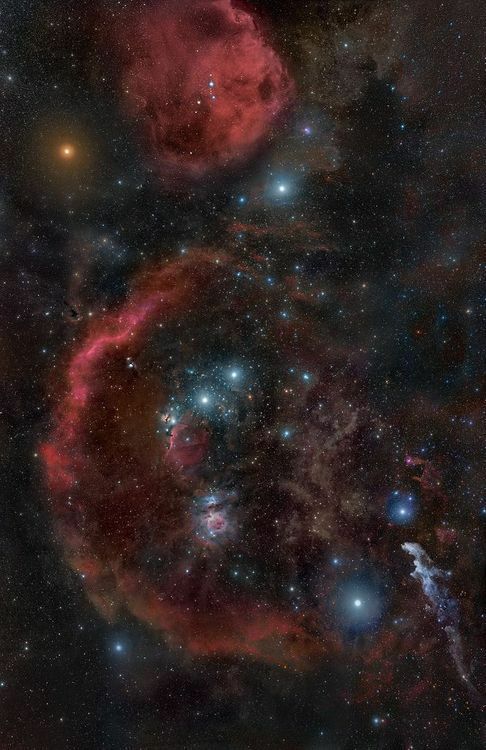 If Betelgeuse were to go supernova right now — as in, if you could break physics and travel to the star instantaneously to check on it — you’re absolutely correct to think that it would take us quite a while to notice. Betelgeuse is about 600 light years away from our solar system, so the light traveling from Betelgeuse has about 600 years of travel before it will reach us. If the star had physically exploded in 2015, we wouldn’t spot the light from that explosion until 2615. We’re constantly observing this star (and pretty much everything in the Universe) as it was, a significant period of time ago. This is also why astronomers say that in studying the night sky, we study the past. The more distant the object, the further in the past we observe. 600 light years, in the grand scheme of things, is pretty close; we’re still dealing with our local neighborhood inside our own galaxy. Supernovae are incredibly bright phenomena. At the brightest point of the explosion, a supernova can outshine the whole galaxy it lives in. A single star has managed to, for a short time, be a brighter source of light than the several billion other stars in its galaxy combined. This is tremendously bright. Supernovae do have a “rising time” of about a week, when the star is increasing in brightness — it stays at its peak brightness for a few days, and then slowly declines into obscurity over a period of a couple of weeks. 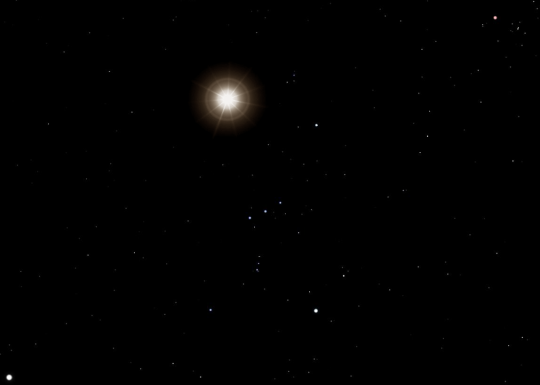 But how bright would Betelgeuse specifically be? We can do some math to work this out, making the assumption that Betelgeuse explodes as a Type II supernova. The exact style of supernova is still up for a bit of debate, depending on the exact rotation speed and mass loss of the star over the next hundred thousand years. Regardless of the exact method of its explosion, all the supernovae options for this star have a peak brightness of approximately the same value, so for a quick calculation that’s good enough to determine what we’d see with the naked eye. There are two ways of measuring brightness in the astronomy world; the first is absolute magnitude, which is the brightness of the star, as it would be measured from a fixed distance. (It’s arbitrary, but the fixed distance chosen is 10 parsecs, or about 33 light years.) This is trying to get to a measure of intrinsic brightness — as though we could line up everything in the sky at equal distance from us, and compare them to each other that way. We can’t actually measure the brightness of a star this way, but we can apply some corrections based on the distance to the star to get to it. The absolute magnitude of a Type II supernova is around -17. Because astronomers have the worst conventions in the world (for largely “historical reasons”), negative numbers mean brighter objects. The sun has an absolute magnitude of 4.83, which, once we translate out of “magnitudes”, means that the sun is 500 million times fainter than the supernova, when measured at the same distance. This huge difference in relative brightness is why a supernova can outshine an entire galaxy. 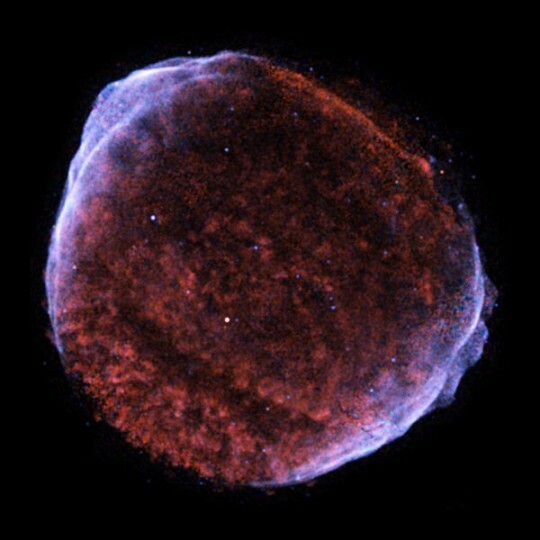 It was said that the supernova in 1006 was bright enough to cast a shadow at night. Betelgeuse, being significantly brighter, would likely also cast shadows — which, if you think about the brightness of a quarter moon, would make sense! All that said, Betelgeuse isn’t expected to explode for another 100,000 years or so. We do expect a few supernova in our galaxy every few hundred years, so there are a number of stars that are nearing the ends of their lifetimes within our galaxy. It’s hard to predict exactly when a star will transition from “close to the end of its life” to “exploding in the next week”, so while we expect that none of these will be exploding in the next little while, it’s difficult to predict which one of the stars will be the first to go. In the mean time, we can take wonderful pictures of the more nearby stars, like the one below taken by Hubble, and watch them cast off their outer layers at an incredible rate.